Should Pakistan Buy Y-9 to Serve as a Tanker? Discussion in 'Pakistan Air Force' started by FuturePAF, Jan 26, 2019. Fighters lose a lot of fuel just in taking off. Loiter time can make the difference in being able to provide enough aircraft in the fight. In the 1967 Arab-Israeli war; besides the surprise raid on the Egyptian air force; the IDF was better at sustainability of its fleet and effective sortie generation capability. With all of the major motorways Pakistan is building, I hope they are keeping sortie generation and dispersal in mind. As part of Sortie generation; aerial refueling can really help the PAF maintain its numbers in the face of 2:1 odds. the 3 IL-76 tankers are great but they are really big and require major runways to keep operating. The C-130 and its Chinese Equivalent could be landed on the motorways. The C-130 has actually been tested in this manner in Germany and South Korea. These were two countries where war could break out and front line lifting capacity is needed. A Y-9 Tanker variant operated in this manner could help the PAF disperse and fight on again an IAF attack. The PAF has 20 Fighter Squadrans; 2-3 Y-9 per squadron would allow the PAF to sustain loiter time and be able to concentrate fighter numbers over a larger area, because aircraft would not have to stay close to base to refuel. Operating from the growing Motorway network, both the Fighters, Tankers, and other Y-9's bring in spares and weapons, the PAF could fight on even if they lose all their bases. A robust infrastructure at key "secret motorway bases" would allow the PAF to stockpile spares and weapons nearby. Dual purpose Fuel depots spread throughout the country could in war time, sustain the PAF. (Obviously secret stores of Jet Fuel would have to be co-located with the weapons and spares; or in mobile trucks in secret locations). PAF is currently digesting the lessons from the latest Shaheen exercise and planning out the next Shaheen Exercise. Motorway Operations should be more and more a part of the Shaheen exercises. It not only benefits Pakistan; but China's ability to disperse and sustain Sortie generation. The experience gained from these operations, will also help market the JF-17 with a Y-9 Tanker and ZDK-03 AWECS as the ultimate combination for a customer to detect, prosecute and sustain the fight. A very good idea. Especially for Pakistan where we are at risk of large scale strikes to infrastructure, keeping aerial assets airborne would increase the potency. Now if they could manage to re-arm the missile pylons in the air - that would be a truly innovative capability. cant rearm in air just yet, lol. But with aerial refueling, the fuel lost upon takeoff can be refilled, and the plane can rapidly return to the fight. If the Fighter is still armed and running low on fuel, it can tank up again and resume loitering to join other fighters and concentrate forces to challenge the enemy with equal numbers. BTW in 2000 the PAF landed a C-130 on the motorway. In 19 years, maybe they have been conducting secret tests. Lets hope they have. Either way, introducing the Y-9 Tanker for Motorway operations can really be a force multiplier and change the whole picture. Our short legged fighters could take the fight to the enemy and not have to use up hard points to carry fuel tanks and sacrifice maneuverability and RCS in order to achieve a longer range. That would also ditch the need for conformal fuel tanks, USAF F-16's don't have them for this reason. I have always implicitly assumed that is how Thunders will be used in wartime. But making multiple refuellers available at squadron level just totally takes it to another level. I mean that would be quite the fleet of tankers for sure. They would be very useful for long range missions except Indian air defence makes any deep strikes quite difficult. We can safely assume that the Indians will give considerable thought and put similar effort in air defence along the Western border and in the Arabian sea as well. Indian CBGs would create a very unfriendly environment for aircrafts. I vote for y-20 but its upto paf . but can our highways handle a y-20? can we afford to lose a y-20 if it is shot down? can the squadron lose a y-20 if on a weight basis, a squadron would get either 2-3 y-9 or just one y-20? also the RCS of a y-20 is larger and makes for a easier target for the enemy. The y-9 won't be going long distances; but rather loitering just far enough to be relatively safe but close enough to top of the fighters so they can keep in the fight. 40-60 Y-9 dispersed throughout the highway network are harder for the enemy to neutralize then 20 y-20. Either way, the PAF can reinforce these highway bases with modest sam systems and EW to minimize the risk of detection and attack. Linking Fighter Squadrons with their dedicated support aircraft (including UAVs) will change the game. 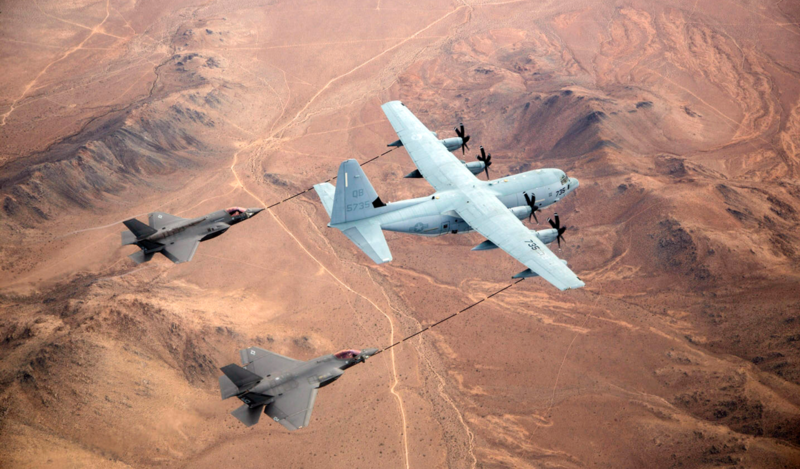 Imagine a Fighter Squadron training with 2-3 tankers (tankers that can double as airborne command posts, EW aircraft, Elint Aircraft, UAV motherships from their wings, MALD-J carriers, Secure Datalink Relay points, etc.) as well as dedicated high altitude long endurance UAVs; linking up with a network of forward air controllers, air defense radars and SAMS, EW and Cyber Troops and ground/sea sensors. The Tankers would serve as backup nodes and re-routing points via their datalinks and on board operators. Training in this environment creates a more vibrant network, where we know our own forces, and have constant eyes on the enemy. We can develop strategies and tactics to maximize defense and offense when we have such a robust network, orders of magnitude more then our current capabilities. 2-3 per squadran is not a lot if you consider the role and the threat. The role is not just as a tanker, but as a flying Command post, with EW, ELINT, Datalink Relay, UAV Carrier as possible additional capabilities). The threat is a massive strike similar to the one that knocked out the Egyptian Air Force in the 1967 war. When threatened, our Y-9s can fly to the western bases and motorway dispersal sites, where they could be hidden among decoys staged nearby to confuse the enemy. The JF-17 could also be disperse to motorway points and mixed in among decoys pre-deployed to minimize the chances an attack would actually knock out our real aircraft. I know the cost is the sticking point. Recent sales of the C-130J are average nearly $100 million per plane. with the tanker upgrades and add communications and EW warfare the price would surely go up. If the Chinese can match the full range of capabilities but keep the price under $100 million it would still be expensive, but a robust platform that should be pursued. I would agree to start with a small order initially. The PAF can start with 1-2 per base and test out how to use these assets to multiply their capabilities. When they see this plane would be a force multiplier, they can always buy more. We have 13 Flying Bases. Starting with an initial batch of 13 aircraft isn't bad. When each fighter pilot and squadron commander realizes how much more effective they are with this Tanker/Command post aircraft support them, they will request more in the fleet to go around. With 13 aircraft, only a fourth to a third would be available at any given moment. that's only 3-5 aircraft. This is why you need 40-60 (funds permitting, in the long term, not while we are going through this financial crisis). This will allow 10-20 aircraft to always be available. Its a $4-6 Billion invest in just the planes, but if the strategy can be tested and validated, it can make the PAF so much more lethal; such as longer range Anti-shipping missions, and loitering JF-17s more available (rather than on the ground and vulnerable) to counter an enemy air strike in the event of war. They carry more air to air missiles; heavier ones, rather than fuel tanks to maintain combat air patrols. I'd rather see SU-35s in PAF than 60 short legged transports. Don't get me wrong, the ideas you have presented are fascinating, and definitely PAF should look into implementing such a system. But I would first like to see Flankers in PAF colors. As far as EW, and acting as relays is concerned, the same can be achieved through UAVs. A two seat Flanker can be an ideal platform for a group leader to stay close to the battle. Flankers can provide buddy refueling as well. And they will multiply the lethality of PAF many times. Its all a balancing act. Just an idea I thought the PAF should study. Its True the Su-35 or better yet the J-31v2 may off other capabilities beyond what a transport turner tanker can offer, but a tanker will loiter longer and refueling many more planes. The PAF will have to decide what mix works best for them within their limit budget. No, those are the wrong reasons. The Flanker is needed for deep naval strikes in the Arabian Sea. Any other use they see shall be on a case by case basis as deemed fit by PAF. Is this Shaanxi Y-9 ?